The son of a Sephardic Jewish father and Dominican mother, Pissarro went to Paris at age 12 to attend school. There, his advisor told him to “take advantage of his life in the tropics by drawing coconut trees.” When Pissarro returned to St. Thomas at age 17, he took this advice to heart. He spent the next five years of his life drawing images of island life: donkey carts, women washing clothes, harbor life, and the Danish forts. Soon, Pissarro’s parents resigned themselves to his choice of profession, and he returned to St. Thomas. He later returned to Paris to study art, where he was influenced by early impressionists. His own style was developing, too–one in which light was as essential as the subject being painted. 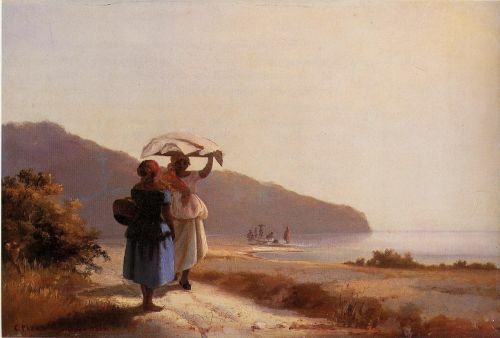 “Two Women Chatting by the Sea”, one of Pissarro’s paintings of St. Thomas. Pissarro developed friendships with other artists on the vanguard of the impressionist movement. In 1874, he joined Monet in organizing independent exhibitions to avoid the scrutiny of the status quo, which was highly critical of this new kind of art. After Pissarro moved to Paris, his parents followed, having left their St. Thomas business in the hands of a caretaker. His parents employed a young maidservant from Burgundy, Julie Vellay, who became Pissarro’s lifelong companion. Despite scathing reviews and poverty, Pissarro remained dedicated to the impressionist method. He became something of a teacher, providing inspiration for artists such as Renoir, Monet, Degas, and Cezanne. By the end of his life, Pissarro had finally begun to receive critical praise for his work. He died of blood poisoning in November 1903. You can still see the Pissaro Building on Main Street in Charlotte Amalie, St. Thomas. For many years a small art gallery was housed in the rooms where young Pissarro first honed his craft. 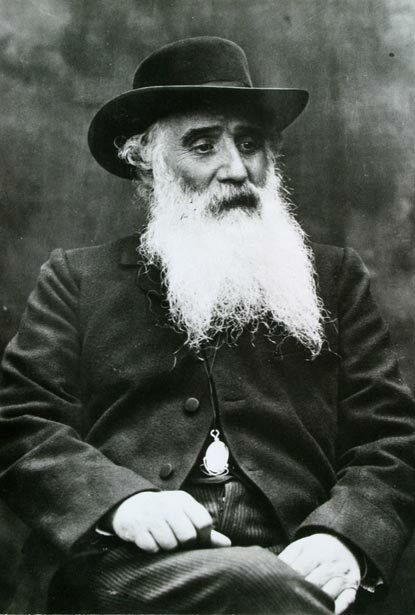 How wonderful that you remembered Pissarro on his birthday! I’ve been to Charlotte Amalie to see the place he was born and posted a photograph of the building on the Facebook page called Pissarro’s Places. My blog about Pissarro — artbookannex.com — features this paintings from St. Thomas. Thank you for sharing this biography and photo. Thanks Ann! I enjoyed looking at your blog. I have seen some of Pissarro’s paintings over the years in the U.S. and Europe, and I enjoy a special feeling of kinship given his St. Thomas connection.